Texting is simple, concise and compatible with virtually every mobile device, operating system and wireless carrier making it extremely accessible when an employee wants to communicate with their colleagues, customers, or prospects in a time-crunched world. However, even though texting is easy, reliable and intuitive —if it’s used for official business communications, it can create tremendous risk for a company. 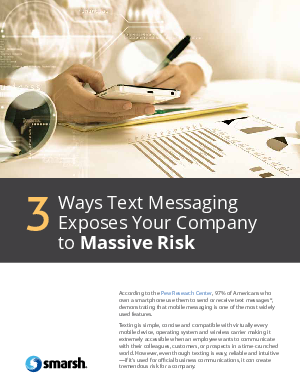 Download now to learn how your company is at risk.